I have put together a selection of my favourite and most essential crystals that can be put under your pillow whilst you sleep. Each pouch includes Citrene , Tourmaline , Amethyst , Grey Agate , Turquoise. 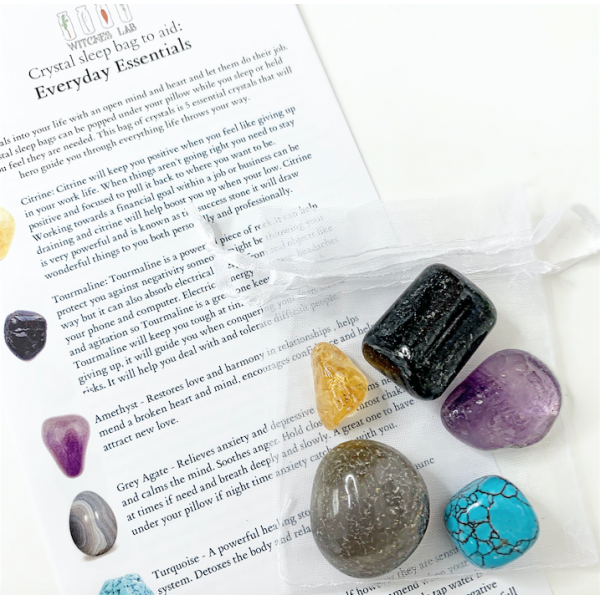 Our crystal bags are a great introduction into the world of crystal healing. Citrene - energy, positivity, motivation. Financial improvement, ideas and mind clearing. Tourmaline - protection against any negative outside forces. If someone is throwing negativity your way this will throw it right back at them. This stone also helps to absorb electrical currents and pollution so is fantastic near your desk. Amethyst - Restores love and harmony in relationships , helps mend a broken heart and mind, encourages confidence and helps attract new love. Grey Agate - Relieves anxiety and depressive feelings, calms nerves and calms the mind. Soothes anger. Hold close to the throst chakra at times if need and breath deeply and slowly. A great one to have under your pillow if night time anxiety catches up with you. Turquoise - A powerful healing stone for the body and immune system. Detoxes the body and relaxes the mind.